Twinlaw Publishing, sponsors of http://www.voteyesborders, are delighted to announce that Dorothy Bruce has been shortlisted in the 2015 H.G. Wells short story competition. The theme for writers in this year’s competition was ‘Class’ – a subject that has perhaps been less to the fore in recent years, but through growing inequality is at the heart of changes in the political arena. 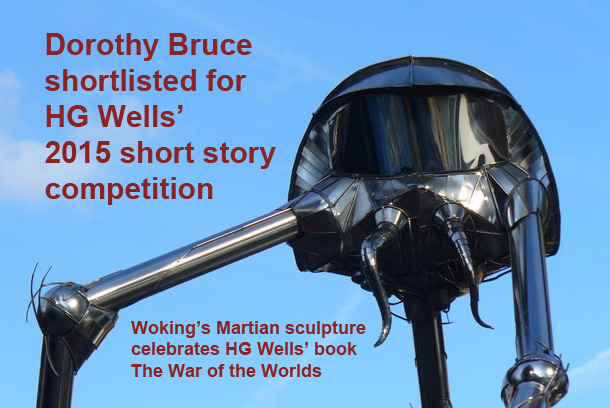 Dorothy’s shortlisting in the prestigious H. G. Wells prize comes as her third novel, Any News from India? is published. Her story, Bowler and bunnet, felt and fascinator will be published in an anthology with all the stories of the others shortlisted. The winners will be announced at the Award ceremony at The Grand, Folkestone on Sunday 29th November. Dorothy is the only writer shortlisted from Scotland. Dorothy’s first two books are political satires set in a parallel country with similarities to Scotland. The first of the Caledon novels, In the wake of the coup, deals with a coup in a country called Downsouth. Given anxious generals in the British Establishment considering the possibility of a real coup, connections to power and control forever clearly lie at the heart of establishment thinking. Dorothy’s second Caledon novel, published in 2014, The Seaweed Cage is the story of a party long accustomed to consider their position in government as their long established right. Three women become enmeshed in a deadly struggle for power within the People’s Union Party in the Caledon Parliament where the Party’s hierarchy is determined to continue reigning supreme and to regain, at whatever cost, their lost rightful government role. Commenting on being shortlisted, Dorothy said: “I am thrilled. As writers we work and sometimes struggle with the art of writing. This is such a boost, knowing that the judges have thought to value your contribution to a competition that has drawn entries from around the world.” Dorothy is the writer shortlisted from Scotland. Her new novel Any News from India? is set mainly in the Scottish Borders where past events and only faint awareness of family connections to end of Raj India suddenly erupt and impact on the peaceful life of a later generation in Borders towns and villages. This entry was posted in Books, Twinlaw Publishing and tagged Any News from India?, Dorothy Bruce, H.G. Wells Short Story competition, Twinlaw Publishing. Bookmark the permalink.